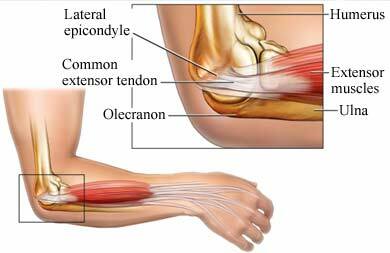 An elbow sprain is stretching or tearing of the ligaments of the elbow. Ligaments are strong bands of tissue that connect bones to each other. You will be asked about your symptoms and how you hurt your elbow. The doctor will look at your elbow to see whether it is stable. Fast facts about sprains and strains. National Institute of Arthritis and Musculoskeletal and Skin Diseases website. Available at: http://www.niams.nih.gov/health%5Finfo/Sprains%5FStrains/sprains%5Fand%5Fstrains%5Fff.asp. Updated January 30, 2015. Accessed June 11, 2018. Sprains, strains and other soft-tissue injuries. Ortho Info—American Academy of Orthopaedic Surgeons website. Available at: http://www.orthoinfo.org/topic.cfm?topic=A00111. Updated July 2015. Accessed June 11, 2018.